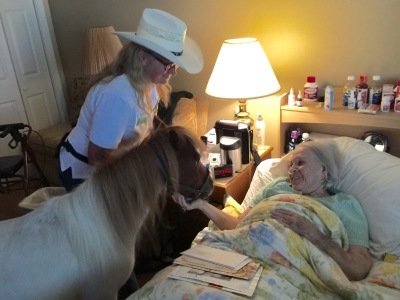 Our mission is to provide motivational, educational and recreational benefits to enhance quality of life for children and adults through mini horse therapy. 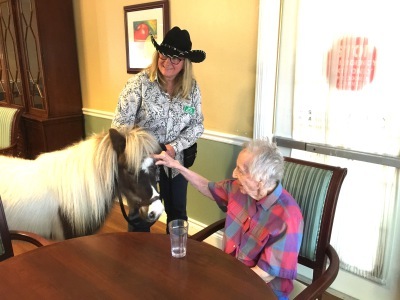 After caring for elderly parents in a long term care setting we realized the value and need for seniors to interact with animals. We also have years of experience in working in healthcare and hospitals. We want to share our love of animals with adults and children, bringing the unique benefits of human-animal interaction into the lives of those that need it most. They stand about 34 inches tall and have the composition of a standard horse. They are loving, caring, calm even in the most chaotic situations and love to be petted or admired from a distance. Our minis are registered emotional support animals, they have been cleared by a veterinarian, are vaccinated and have participated in a rigorous training program. And they LOVE attention! Our professional handlers are certified pet therapy handlers. 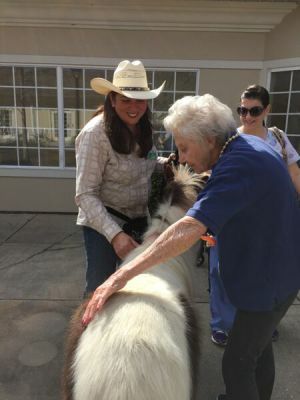 Our animals are accustomed to interacting with children and adults in all stages of life, from the bed ridden patient to children with developmental disorders. For more information or to schedule a visit, contact us through our secure contact us page. We will get in touch with you within 24 hours. On visiting day, the mini horse will be clean, groomed and wearing an official therapy vest and id badge. Our handlers will have identification badges, grooming materials, and treats. Each visit will last up to 2 hours. The mini horse will be managed by the handler and lead throughout the facility stopping along the way for interaction. The patients/residents will be able to participate in group and/or individual settings of petting, hugging, grooming and feeding (treats). The mini’s are trained to interact in all settings from groups to bedside. They are trained to be calm and accepting of touch and sound. Access to ample space to park a standard size pick-up truck and a horse trailer and ramp access to the facility (wheelchair ramp will suffice).